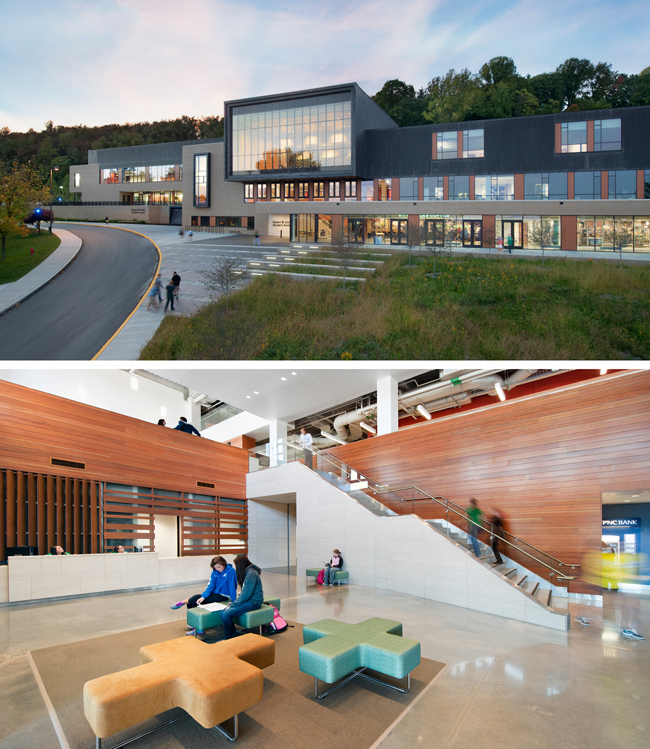 DESCRIPTION: Centrally located between residential and academic areas of campus, the Robert M. Smith Student Center at Slippery Rock University is designed to create a programmatic and visual hub for student life and community outreach. Organized around and radiating out from an unfolding open atrium, the spaces are arranged by floor – from active and social to quiet and contemplative, reflecting various campus communities’ desired hierarchies of spaces. Large congregation spaces are designed as flexible, multipurpose venues and are projected from the inside out, creating major cantilevered frames that define focal points. JURY COMMENTS: The jurors appreciated the elegant façades, which were skillfully composed from large scale, program elements down to subtle patterning of the surfaces. The exterior of the building functions as an invitation to the spaces and activities inside. 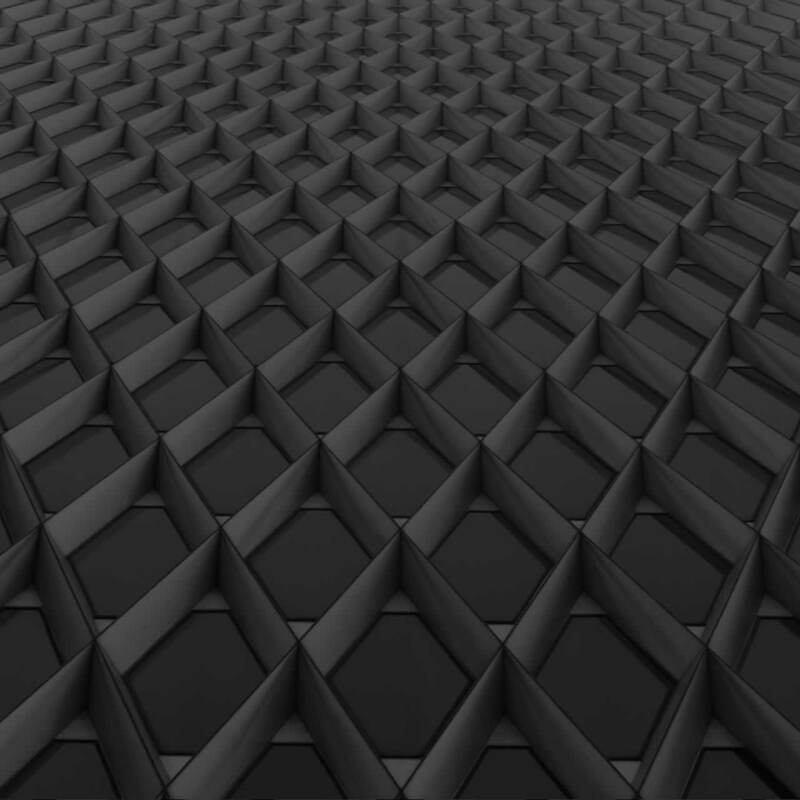 Interior spaces are flexible and adjust to a variety of uses. These spaces transform, but remain grounded and characterized by their materials, proportions, and relationships to the site. The total project has a character that is more than the sum of its parts. DESCRIPTION: The first phase of a master plan that will build capacity in a region of Haiti largely focused on subsistence farming with limited means and opportunities, the Sant Lespwa, Center for Hope is a community resource center, including a welcome center, community room, administrative area, social spaces, and a soccer field. 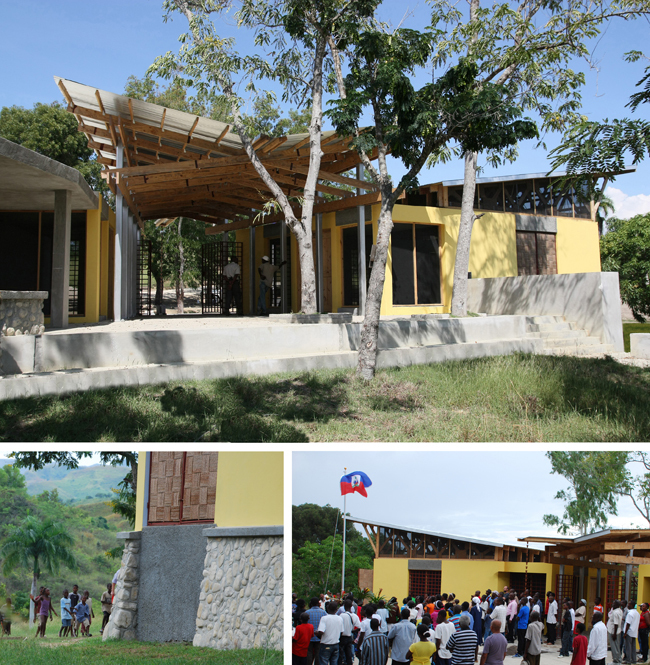 On a site without utilities or infrastructure (except for a dirt road), the Center for Hope is designed to be self-sufficient through planning for natural ventilation, daylighting, water collection, and sewage treatment. 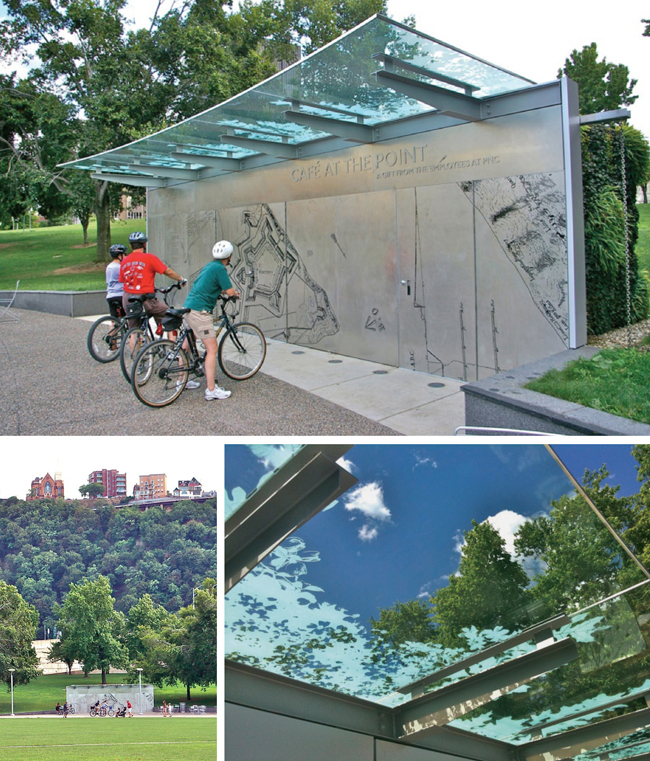 DESCRIPTION: The Cafe at the Point is an outgrowth of an extensive restoration of Pittsburgh’s Point State Park. More interpretive wall than building, etched stainless steel panels on the front facade highlight the historic significance of the site. Overhead, a glass canopy contains translucent images of native foliage. The 230 square foot Cafe contains a compact kitchen, storage, and ADA toilet and features recycled steel and masonry, skylights, and high-efficiency LED lighting. ARCHITECTURE FIRM: studio d’ARC architects, P.C. DESCRIPTION: This project is a collaboration between the owner/builder, the architect, and a team of local, national, and international experts to design a new 7,000 square foot office building and site reclamation with the goal of making it the most energy efficient and sustainable structure possible with the highest amount of low embodied energy and locally sourced materials and labor. The site strategy provides walking trails for staff and eliminates off-site stormwater runoff by using porous concrete in parking areas. The building’s goals of blending in with the natural habitat and to connect to the environment via material selection, systems integration, and design considerations were achieved through the use of natural, high thermal mass, recycled, and salvaged materials, along with daylighting and view opportunities. 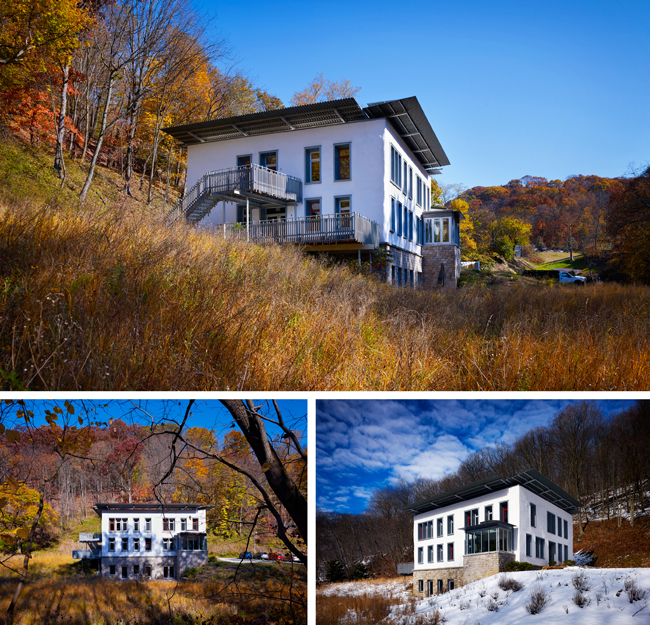 DESCRIPTION: The Center for Sustainable Landscapes is conceived as a building that provides both a home for administrative and classroom functions and a tool to further the institution’s mission “to advance sustainability and promote human and environmental well-being through action and research”. 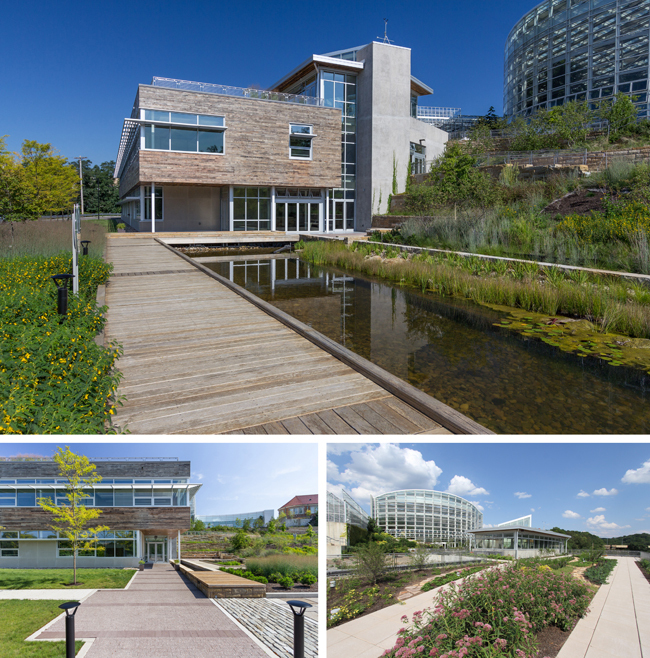 Using three rating systems – LEED Platinum, The Living Building Challenge, and The Sustainable Sites Initiative – as tools to help project, track, and achieve objectives, the Center was designed and built to achieve a net-zero energy facility, achieve net-zero water management, and restrict the use of any “red-listed” materials, harmful to people and the environment, as well as a rigorous implementation of passive design strategies that reduce energy consumption and increase the quality of the work environment. DESCRIPTION: St. Thomas A’ Becket Church is designed in part to reinforce and emphasize the shared celebration of the Catholic mass and the sacrament of Communion, in particular via a drape-like “east wall” behind the Altar, designed to echo the uplifting folds of the Priest’s vestments during the sacrament. Utilizing digital visualization tools, the “east wall” was virtually constructed and analyzed, and then constructed employing both contemporary metal stud framing methods and traditional lath and plaster. 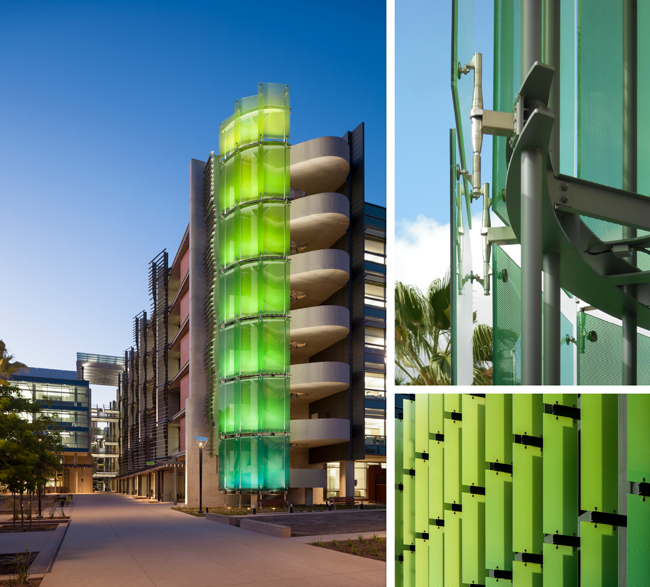 DESCRIPTION: Decorative glass elements were envisioned as expressions of the creative culture and identity of the project, but also as a unifying tool for this quadrant of campus and a way-finding device. The glass elements occur at key architectural moments or site locations, positioned on structures or in the landscape to simultaneously take advantage of the site axis and views. DESCRIPTION: The PURIFLUME is a mobile, proof-of-concept, closed-loop water filtration system featuring elements commonly found in a municipal spray park. The project’s primary goal is to collect data on the viability of a closed-loop water filtration system and the sanitary conditions of the water as it is treated by each piece of technology, in hopes of supporting environmentally friendly spray parks, as well as provide educational experiences on sustainability throughout Pittsburgh. DESCRIPTION: The Metropole, a 10-story historic building in the heart of downtown Cincinnati, was one of the largest hotels in the city when it opened in 1912. Since closing nearly 40 years ago, the deteriorating building had been used for low-income rental housing. 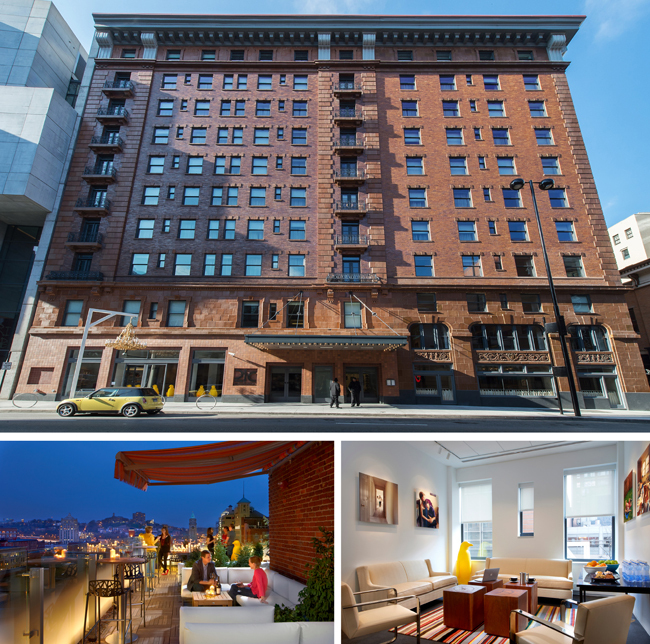 The building’s restoration back into a hotel features 156 guest rooms and suites, a contemporary art museum, a restaurant and bar, a spa, and meeting spaces. The design team worked closely with the State Historic Preservation Office to evaluate existing conditions and restore as many elements of the original fabric as possible. DESCRIPTION: Dollar Bank’s original branch location, completed in 1871, anchors the Fourth Avenue Historic District. 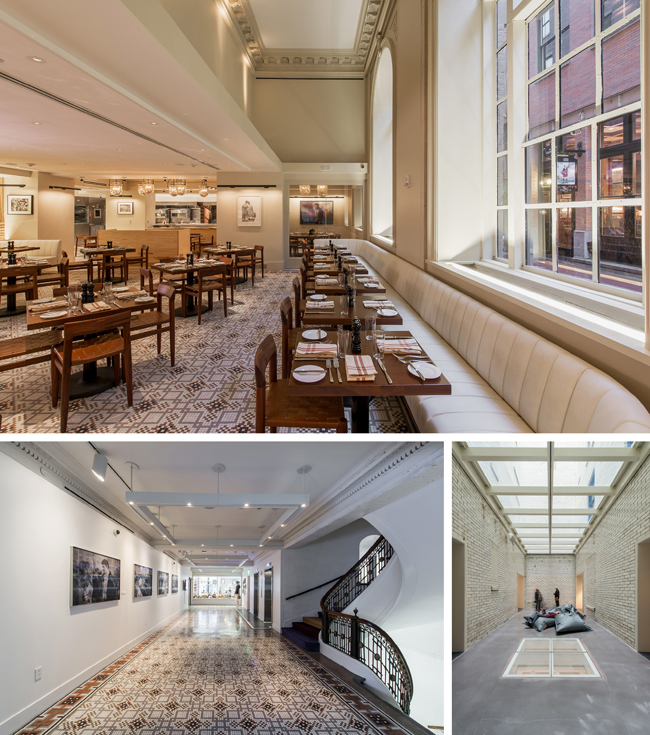 Renovations to this 5,000 square foot banking hall strived to adapt the space to support employees and clientele while maintaining and preserving historic features. 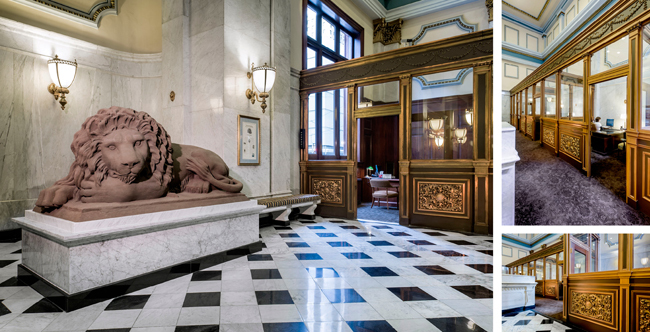 The main objectives were transforming the Private Banking area to match the character of a 1905 addition, coordinating the restoration and re-installation of stone lions dating to the bank’s beginnings, and documenting the building conditions for future phases. JURY COMMENTS: The juxtaposition of the lions as a new interior feature and a solution to a technical preservation issue was well played and created a new dynamic within the historic context. The choices about replacement and restoration were expertly made and executed. DESCRIPTION: Deftly integrating old with new, the design team carefully restored this 100-year old hotel to its original splendor. The building had seen rounds of insensitive renovations beginning in the 1970s, including dropped ceilings, ductwork piercing ornate ceiling trim, and carpet and vinyl overlays covering wood and tile floors. These previous renovations were undone, uncovering original iconic features while adding sleek, modern complements throughout the hotel. ENGINEERS: Cintar Engineering and Consulting; Precision Electrical Contractors, Inc. DESCRIPTION: MAYA is known for its unique brand of human centered and experience design. 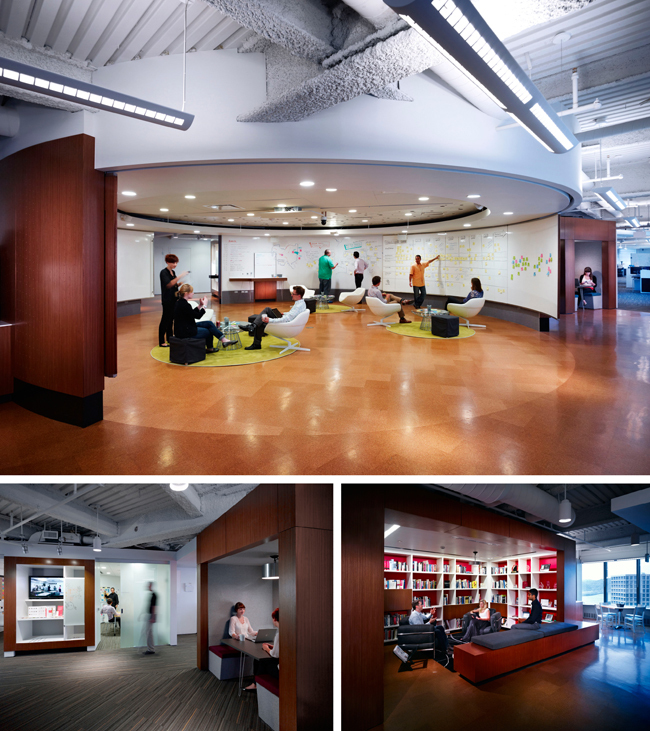 MAYA’s space is critical to their process of understanding and solving problems. The space encourages the interdisciplinary work ethic along with the logic of MAYA’s service delivery system. Team rooms, huddle space, neighborhoods, labs and Kivas® strategically located throughout the space supports a culture of flexible thinking. JURY COMMENTS: The jurors appreciated that the design stayed true to the diagram which illustrated a clever approach to space planning, an invention to respond to a unique company culture in a standard office building. The family of “kivas” was carried out with no apparent compromise in function, material, or detailing. 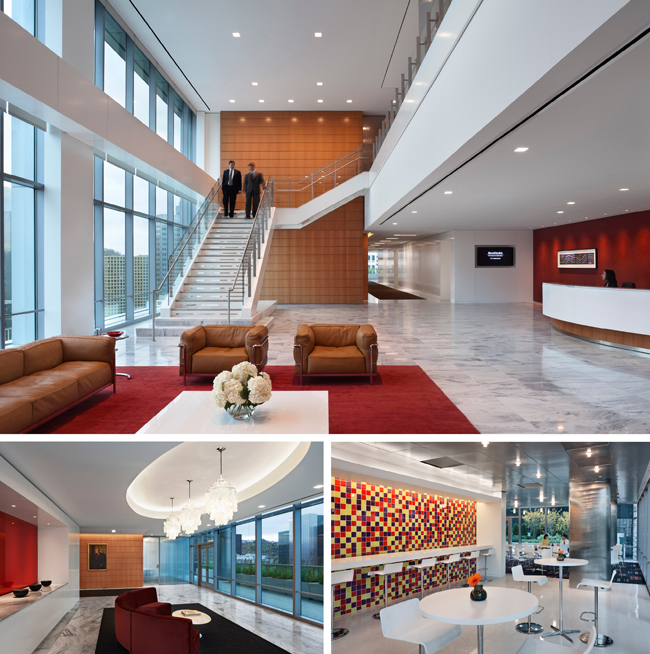 DESCRIPTION: Downsizing and shifting from traditional law firm aesthetics to a more contemporary style with sustainable qualities, the redesign of Reed Smith LLP maintained its customary wood look while adding mixed materials. 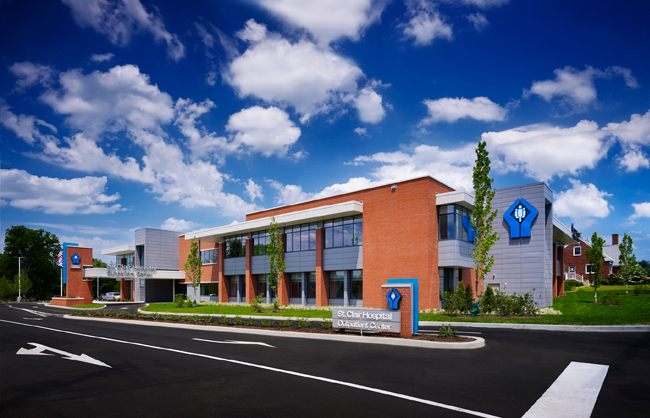 In only eight weeks, the office transitioned to a space better equipped to accept new technologies, meet the demands of today’s workforce, and provide a healthy, sustainable environment. JURY COMMENTS: The simple and elegant detailing and the relationship of the interior to exterior spaces was well appreciated by the jury. The compositions of brown and red, a tough combination, is very successful, almost surprising. The refined figure of the wood wall in the two-story space is restrained but affective. 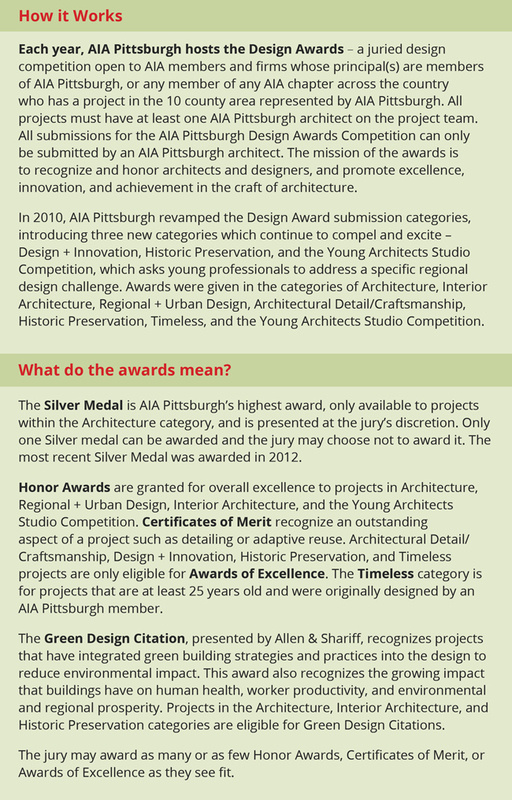 DESCRIPTION: This year’s challenge is to create an unique urban and architectural opportunity along the portion of The Great Allegheny Passage within Pittsburgh, land that once housed the corridors of our industrial past. 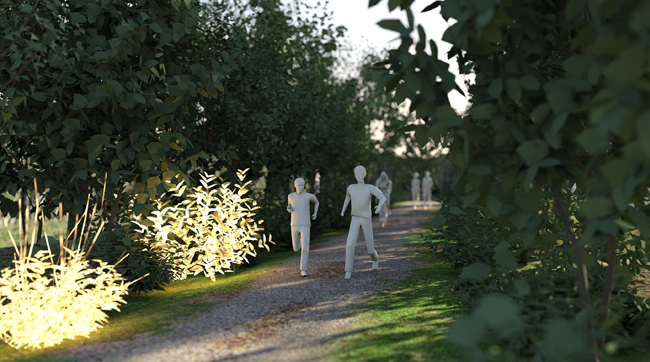 With a slight suspension of disbelief, Light Trail creates a path in which the trailside vegetation itself becomes a luminaire that reacts to the speed, proximity, and orientation of trail users, making them more aware of their place and interaction with nature. JURY COMMENTS: Innovative use of current day scientific experimentation to solve a place making challenge. Incredibly creative way to use nature to have it interact with us and effect the way we understand our interactions with it and with each other. Simple, compelling visualization and use of diagrams. Humble and effective proposition.